If you’re looking to try out a new set of strings on your bass guitar, there’s a surprisingly large number of options out there. Besides the option of string gauge (thickness), you can explore different materials and windings that sound and play vastly different. After scouring bass forums, striking up chats and trying some strings first-hand, we identified 7 of the most-praised sets of bass strings. 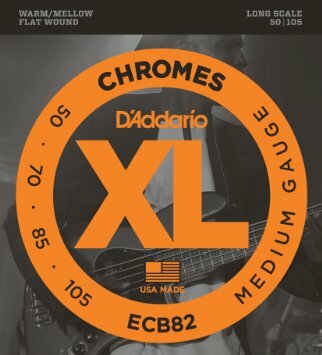 Between those 7 is a wide range of prices, materials and designs (flatwound vs. roundwound) that can serve many different types of bass players. Roundwounds are the most common type of bass string today. Their coarse texture produces a brighter tone, suitable for modern rock & pop. What’s it good for? Best standard strings: Affordable, versatile and not too “extreme” on any tonal front. A little brighter, these are good for bassists who want their slaps, thumps and finger-noises to shine through. Treble kicked up another notch. These are extremely high output strings, good for hard rock & metal. Those looking for a “piano-like” bass tone. These are full, punchy strings with high-end clarity. Flatwounds are a more traditional string design. They produce a deeper, mellower tone that’s suitable for jazz, country, r&b and reggae. Smoother to the touch, flatwound strings are also easier on the fingers. What’s it good for? Those looking for a vintage / mellower tone. Great for jazz, country, r&b, roots rock, etc. Those who want flatwounds without sacrificing too much high-end. These strings are a “modern” take on vintage flatwounds. Dubbed “vanilla strings” these low tension flatwounds have no tonal extremes, which makes them great for recording. Flatwound vs. Roundwound Bass Strings? 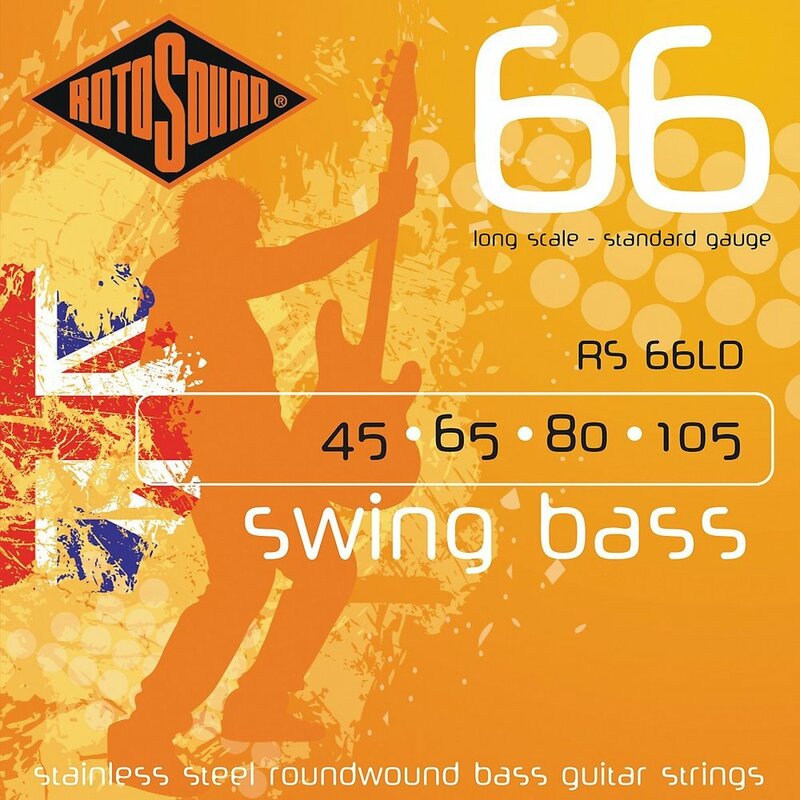 The biggest distinction in today’s bass string market is flatwound vs. roundwound strings. Flatwounds were the first kind of electric bass string to emerge in the early 1950s. Roundwounds arrived shortly after to accommodate rockers (ahem, John Entwistle) looking for a hotter, brighter tone. They’ve since become the industry standard, although there’s still lots of love out there for flatwounds. The difference in design makes a huge difference in how the string feels against your finger. Flatwounds are smooth to the touch while roundwounds are a bit more coarse. This might make flatwounds sound like the better choice for beginners. However, flatwounds also tend to have more tension, which means they’re harder to press against the fingerboard. The 3rd major difference between roundwounds and flatwounds is how long they last. Well, how long their tone lasts. Roundwounds tend to lose their brightness after a few weeks. This is because the small spaces between grooves gradually fills up with dirt and grime. Some people don’t mind this “deader” roundwound tone. Others, however, will change their strings on a weekly basis to keep their tone sharp. Flatwounds, on the other hand, can maintain their tone for months, or even years. Some users of the Thomastik-Infeld JF344 (affectionately called TI Flats) have claimed to use them for years without noticing any tonal differences. When you consider how much money you’d spend replacing Ernie Ball’s every week, the $65 price tag on TI Flats doesn’t sound so bad. Now that we got the roundwound vs. flatwound debate aside, we can talk about the next biggest tonal factor: the material of the string. Pure Nickel: The original material used to produce bass strings. Pure nickel strings (like flatwounds) are warmer and mellower. Though a bit more expensive, pure nickel strings retain their tone the longest. You don’t have to replace them as often as stainless steel or nickel-plated strings. Stainless Steel: A newer development, stainless steel strings are much brighter and offer more gain than pure nickels. On roundwounds, the texture is a little more coarse than nickel. (You’ll notice a little more friction against your fingers.) It also producers more “finger noises” from scratching against frets. Nickel-plated: The most common type of string. These strings are made of steel that’s coated with a thin layer of nickel. The result is a balanced, “middle-of-the-road” tone. The steel provides some brightness, while the outer layer of nickel adds warmth and makes it smoother to the touch. String gauge is the thickness of strings, measured in thousandths of an inch. When comparing gauges between packages, typically the first (highest) string is used. So “45 gauge” would refer to the thickness of the highest string (0.045 inches). Generally speaking, the thicker the strings, the richer your tone. However, thicker strings can also be harder to play, as they require more strength to press down. 40 and under: Light. Easy to play, weaker tone. 50 and over: Heavy. Harder to play, but stronger tone. The majority of our recommended strings are 45s. Ernie Ball Nickel Wound and Fender 9050L, however, come in a wide range of gauges. I got bored and skipped to the bottom. What strings should I buy? If you want the best middle-of-the-road option, go with Ernie Ball Nickel Wound Super Slinky (45 gauge). They’re the most popular material and style (Nickel-plated roundwounds with medium thickness). They won’t feel too tight, or too loose to the touch, and they’ll produce a sound that most people expect to hear when they pluck a bass string. We scoured bass forums to identify the 7 most-praised sets of bass strings. Check out our comparison and choose the perfect set for your rig. Ready to graduate from a clip-on tuner? Pedal tuners are great for live gigs and loud practices, but not all are created equal. Read on for our comparison of the 3 top models. All you REALLY need is insulated wiring and a solid connector jack. Check out our guide to the best guitar cables for the money.